Members of Turriff Ladies Circle made a visit to RNLI Macduff last night to make a donation of £500 to the station. The money was raised at the Ladies Circle, Glitz and Glamour sale at the BP Centre. 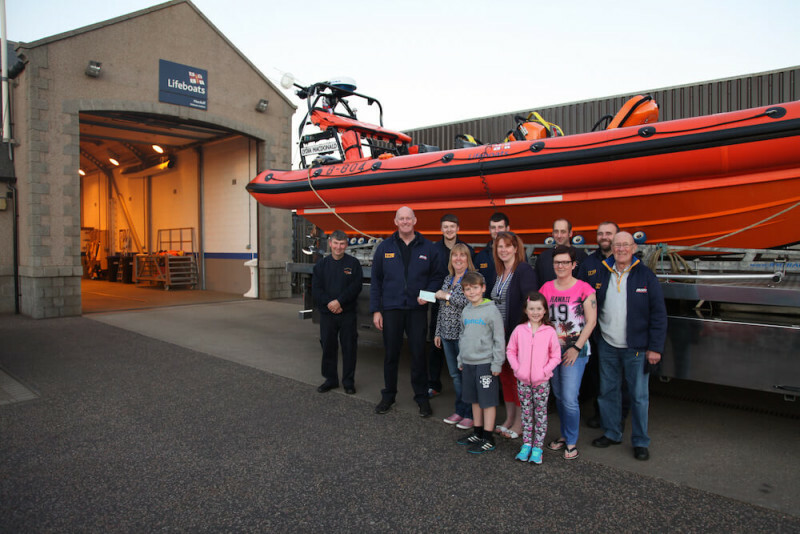 Members of the RNLI Macduff volunteer crew & Turriff Ladies Circle at Macduff Lifeboat Station as Nichola Rhind of Turriff Ladies Circle presents Chassey Findlay from RNLI Macduff with a cheque. We held a Glitz and Glamour sale evening at the Baden Powell Centre in Turriff in July to raise money for the lifeboats. All the money from ticket sales and 30% of any sales on the night was for the lifeboats. The Royal National Lifeboat Institution is funded by public donations such as this and we are extremely grateful that Turriff Ladies Circle have decided to support us again this year. Every penny donated to the RNLI goes to supporting out volunteer crews, saving lives at sea and educating people to respect the water. RNLI Macduff fund-raisers are holding a Fashion Show and Lunch at Celebrations on 28 October.